An owl can look beyond the surface to see the real truth underneath mountains of fluff. Owls are spiritual mirrors, totems that force us to face the thing that we fear the most - our true selves reflecting in their enormous eyes. Since the beginning of our cultural identity, humans have always been fascinated by these enigmatic creatures, partly because we don't quite understand them. Like all nocturnal creatures, they shy away from the chaos, noise, and confusion of the day and hide away in the comfort of the calm shadows. Owls love to seek refuge in hollowed out trees and strange places that tend to kick our imaginations into overdrive. We fear owls because they are at their best at night, the time of day when mankind is at its most vulnerable. Owls silently roam the skies during the Witching Hour with the ghosts and demons that are believed to come out at that time. The Owl is actively engaging and interacting with the world during the twilight hours of dusk and dawn, times that linked with the spiritual realm. This is why cultures like the ancient Celts, Egyptians, and even the Hindus see owls as guardians of the realm of the dead and protectors of lost souls. For them, owls helped spirits transition between the worlds by acting like signposts in the darkness of the night. Owls are dream-catchers; bringing messages from a realm beyond that which we can see, touch, and hear. In many Native American cultures, the images of an owl and a dream-catcher are sometimes intertwined to represent this concept. The Owl warns of pending doom and if you are wise and heed its warning, you might just be able to save yourself from heartache. But what drives us to fear the Owl isn't the fact that it prowls around in the darkness; it is the fact that it does so, quietly. You never know when one is watching your every move until it swoops down and frightens you with its terrifying cries. Their bodies are so perfectly adapted for night life, that it is almost impossible to hear them. Owls are the stealth fighters of the avian world with wings designed to minimize drag and noise during flight. Their wings have special features that effectively kill most of the flapping sound usually associated beating or moving wings and these design features are so effective that the sound is muffled to decibels well below the hearing range of most of the animal's prey. Add to that the animal's heightened senses of hearing and vision and you have an efficient killer. This is probably why the Kikuyu of Kenya see them as harbingers of death and in folklore cultures across the Arab world believe that owls are bad omens. The same is true throughout Latin America and the Caribbean. This legacy has been handed down from the days of the ancient civilizations that roamed the area during the Mesoamerican era. From the Aztecs to the Mayans and every other culture that has existed since then, owls have been viewed as warning signs of one's impending doom. The Ho-Chunk Indians believe that the decline and death of one of their most famous chiefs, Glory of the Morning, was heralded by the appearance of an owl that had called to her by name. In Mexico, the phrase, "when an owl cries, an Indian dies" still exists, showing just how deeply rooted this reputation is. Owls are also connected with various deities and gods throughout the world. In Greece, the goddess of wisdom, Athena, was often depicted with an owl and in Hinduism, owls are the avatars of the goddess, Lakishmi. Of course, the Owl is most noted as a symbol of intelligence and wisdom. In the popular cartoon series, Avatar: The Last Airbender, it is no surprise that the keeper of sacred knowledge was depicted as a Barn Owl. This connection to wisdom comes from the bird's link with the Greek goddess of knowledge, wisdom, and foresight, Athena, which in turn may stem from the fact the owls have incredible vision. Their remarkable, memorable eyes give them unbelievable depth perception, allowing them to pluck prey from the ground with grace and style. Part of this link also originates from the owl's ability to look behind with its 270o field of vision. When you encounter one in the wild, the bird's head will follow you (regardless of where you go) while its body remains perfectly still. Its eyes will remain bright and unblinking. This creepy ability can leave you feeling that the bird is watching more than just your physical body - it's almost as if it is staring into very soul (sounds strange, doesn't it?). For this reason, many ancient cultures see the Owl as a keeper of secrets and a being of foresight - nothing gets past those formidable eyes. Absolutely nothing. Owl Tattoos are as varied as the number of owl species out there. You may identify with the mysterious presence of the Barn Owl or see yourself as a graceful and elegant Snowy Owl. 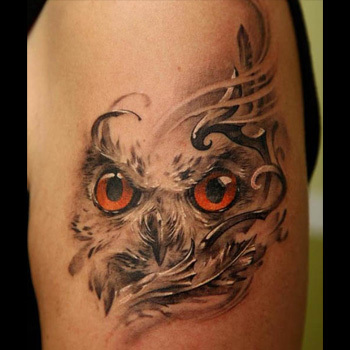 Owl Tattoo designs tend to feature birds that have an obvious physical trait, thus making it easier for you and the public at large to identify the avian on your torso. Popular ones include Barn Owls (have large facial features), Snowy Owls (for their pristine white plumage), and Long-eared Owls (for obvious reasons). In the European context, owls are seen as mixed blessings. On one hand, an owl was the bearer of wisdom, while on the other it is the harbinger of death. The ancient Celts viewed these intelligent creatures as guardians of the souls of the dead, as such, the notion that seeing one (or at the very least hearing an owl's cries) was tantamount to receiving an invitation from the hand of Death itself. The Owl guarded the underworld, ensuring that all who entered this realm were safe from the dark forces of the universe. Celtic Owl Tattoos draw on this concept, representing your fear and reverence for these mysterious creatures. For Native Americans, owls are bad omens. Although owl feathers are often worn to ward off evil spirits, seeing an owl or hearing its cry is taken as a sign that death and destruction is near. Throughout much of Latin America and the Caribbean, an owl or a Patoo is seen as a guardian of the dead, a tradition which stems from the Mesoamerican era. For the Mayans, owls carried messages from the Place of Fear, a realm inhabited by vicious demons, condemned souls, and owls. The Aztec god of Death was often shown with several owls in tow. As such, most Tribal Owl Tattoos have a close link with Death and Misfortune. Owls represent more than just the unshakeable fear of Death. They are meant to be our beacons of light and knowledge as we journey towards the Great Unknown. Getting an Owl tattoo is a great way to show your acceptance and deep spiritual understanding of the final phase in life. Capturing the bird in its true essence can be a difficult task, but our team of artists is more than happy to come to your rescue. Simply visit our design page at www.itattoodesigns.com and take advantage of our Custom Design Service.